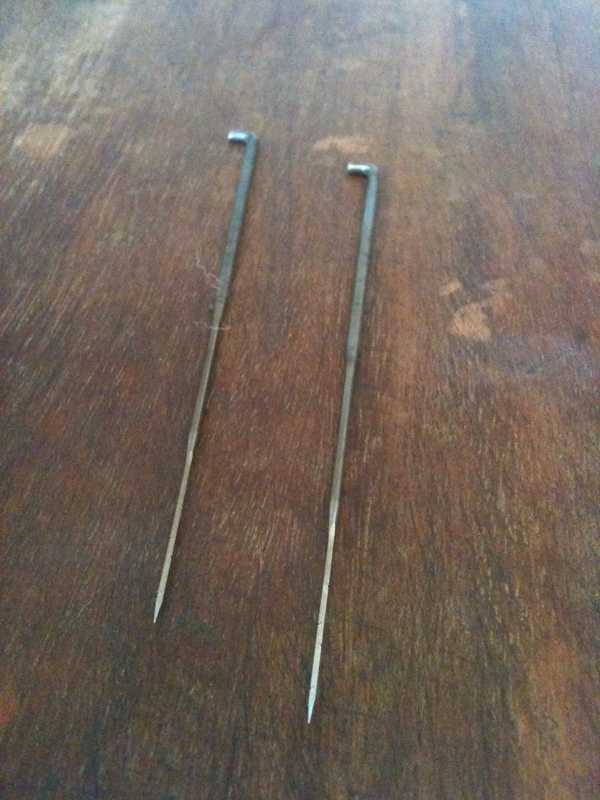 I like sharp things. Wit. Knives. Dressers. I’m also klutzy enough to have a self-imposed rule that forbids me to talk while chopping vegetables; my greatest fear (after cilantro-wielding clowns) is running out of band-aids. So imagine my conflicted delight when I saw a felting session listed as part of my Art Camp for Big Kids creative retreat extravaganza. Prior to this past weekend, my knowledge and experience with felt was limited to those 8×10 rectangles of color that they sell in craft stores. My takeaway after this weekend: felt needs to hire a better PR person! Lordy! It’s fabulous! 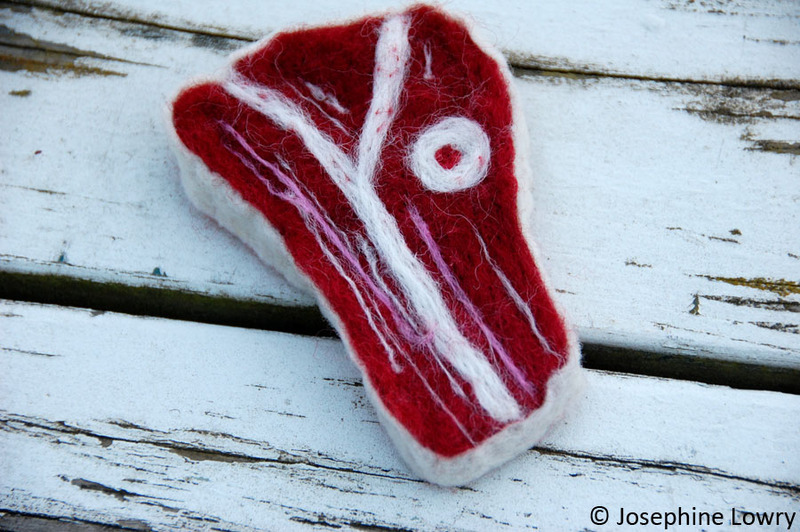 If you’re not familiar with felting, it essentially entails repeatedly jabbing special barbed needles into roving. And unlike Facebook poking which makes no sense, felting yields something tangible like this adorable owl. My first felted project: an apple! For our session, Kari and Mandy of Bossy’s Feltworks patiently and enthusiastically taught us how to make apples from red roving. 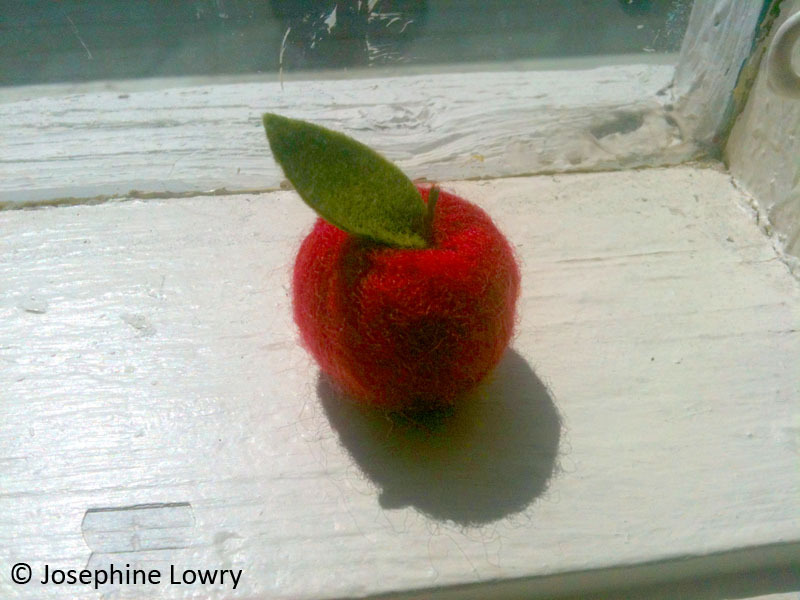 The felted apple was really simple to make and I was struck by the cheerfulness of it. It’s round shape is clearly the gateway to other projects like cherries or pomegranates or rabbit turds. 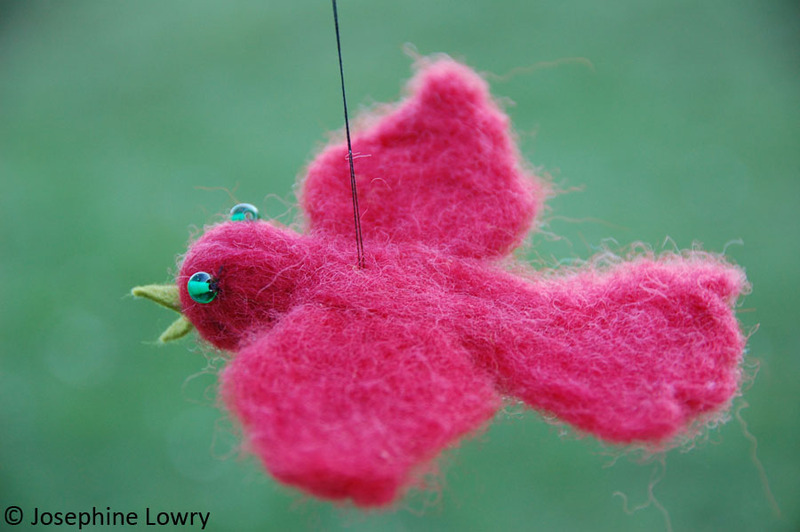 Fly, felted red bird, fly! So with an apple-looking apple behind me, I was ready to take on more roving and non-round shapes. After failing to create a felted beak for my red hummingbird, I changed direction and cut out a chirpy beak from flat green felt. And wah-la! Meet “Scarletta,” a chirpy red flying bird. As a food artist, it was only matter of time before I went to the meat side. Thanks to the encouragement of my Art Camp mates, I accepted their challenge to make a t-bone steak. And while I already found repeated stabbing of a felted apple to be an excellent stress reliever, felting a big ole steak is stabvana! Poke! Poke! Poke! Again and again! And again! It’s like I have a point to make! Ha ha! Hee! (I know, I know, don’t quit my day job). By adding small pieces of twisted roving, I created marbling and I used a round piece of white roving for the bone. Delirious with confidence and creativity, it wasn’t long before I started laughing maniacally. I had an idea. You see, I love parasites. Not in me, mind you. Ick factor aside, parasites are quite remarkable. Don’t believe me? Take a gander at Monsters Inside of Me. Having recently finished a mosaic tapeworm platter (ed note: look for a future “parasite platter” blog post — not gross, I promise), I was ready for a new parasite in a new medium. 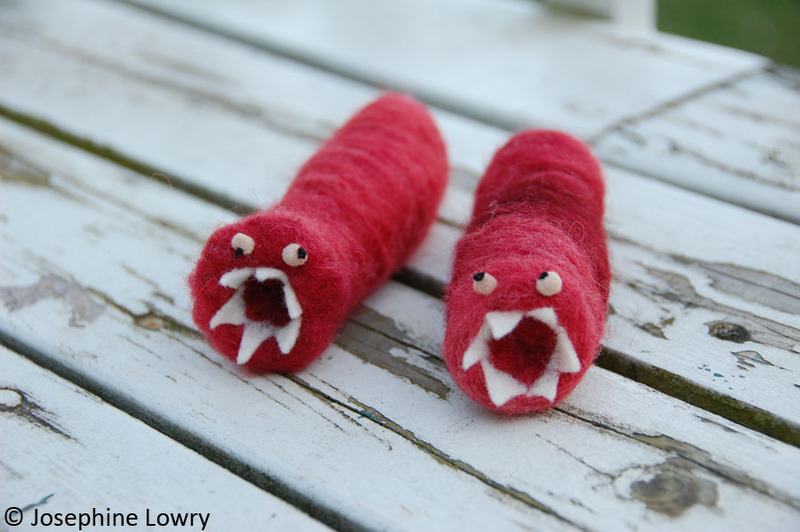 And thus, it is with great affection and pride that I introduce felted liver flukes! I’m not sure bot flies have the potential to be cuddly, but I feel compelled to seek out some white roving so I can felt some. Oh. And a heads-up to my family and friends, instead of canned goods this year, you may just get some felted bot fly ornaments for your Xmas tree! You could do a whole meat series and sell them! Love it! A meat series and a parasite series! meats and their associated parasites, as in beef with e. coli, chicken with salmonella, pork with…i dunno, those brain worms. it’s cuddliness meets education. awesome. Erica – Like chocolate & peanut butter! I like it! er….. dark chocolate and almonds, rather. Those liver flukes are impossibly cute. I’m looking forward to your entire upcoming collection!